Ever hear of 'Bear Metal'? Me neither. Norwegian band Svölk (translation?) claims their debut album is history's first bear metal album. 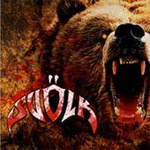 Novelty or not, Svölk sound has the weight of a charging 500 pound bear. Openers 52 and This Is It have heaviness, and plodding, of something near doom or stoner metal. While this will find its place throughout this work, the remainder of the songs are more well-paced yet heavier melodic rock. Svölk owes as much to Black Sabbath as they do to NWOBHM, with a touch of 70's psychedilic rock. You can hear the latter on Miss Alcohol. Generally, the songs chug along with big riffs over a massive bottom end. It's the badass bear chasing you through woods. The one that will eventually rip you a new a**hole if you don't stop turning around to see how close he is. Stay ahead of the music by cranking it up. Svölk is a strong debut of heavier melodic rock and proving, thankfully, that Norway exports more than goulish face-painted black metal. Recommended. Svölk is a strong debut of heavier melodic rock and proving, thankfully, that Norway exports more than goulish face-painted black metal.